A 3-phase Brushless DC motor control based on a motor control DSP controlling Infineon half-bridge intelligent power modules (IPMs). In a continuous drive for smaller and higher performing products, a world leader in laboratory pumps developed a new pump that would significantly move the bar. The new product would be powered by an efficient, brushless DC motor supplied from a 24V DC in-cord power supply similar to the ones used to power laptop computers. The combination would allow for a very small pump taking up one-half the bench space compared to their existing products. With product plans in place, Tecnova was called-in to join the team. Our role would be to develop the motor drive electronics, user interface electronics, and firmware inside the product. The design called for a continuous 75W of output power and 2 to 3 times the continuous torque (current) for starting. The electronics was also tasked to manage analog and contact closure process control inputs and outputs, a membrane keypad, and a graphic LCD display. 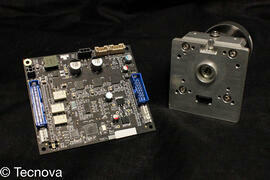 This all was to be accomplished with a defined footprint (3” X 3.5”) and with no external heatsink – and at low cost. Fortunately, modern and inexpensive DSPs are up to the control challenge. A 16-bit DSP was chosen as the controller. At a blazing speed of 140 MHz, and supporting dedicated hardware for motor position feedback, current sensing, and 3-phase PWM, Tecnova was able to implement an effective vector control using only a small fraction of the processor’s available instruction cycles. The product delivers smooth 0-300 RPM performance while maintaining seamless refresh of the 128 X 64 pixel LCD and responsive I/O. Three half-bridge drivers were chosen to drive the 3-phase bridge powering the motor. The maximum 5.0m Ω (@ 25C) RDS(on) of the half-bridge MOSFETs coupled with the synchronous rectification of space vector PWM permitted operation without a heatsink. The entire power stage including two conductive polymer hybrid Aluminum Electrolytic bus capacitors occupies less than 2 sq-in of PCB area. The assembly is 0.5” high. The new product is pumping up sales by meeting expectations for ever improved performance in a smaller package and at a lower price.